Mike Needs Your Help to Stop His MS! Mike Carns had his life turned upside down in 2013 when he was diagnosed with multiple sclerosis, an inflammatory disease which damages the insulating covers of nerve cells in the brain and spinal cord. This was discovered after he had knee and hernia surgery and continued having problems walking. An MRI scan confirmed the devastating diagnosis of MS. Mike’s degeneration has been rapid and in less than two years he has gone from walking unassisted to using a cane, a walker, and now a scooter. Mike has the opportunity to go overseas for low dose chemotherapy and a stem cell transplant to halt the MS and “reboot” his system to reverse the prior damage. The procedure is called HSCT and though it is only in the third trial phase in the US, it is being performed routinely in many other countries with great long-lasting results. The challenge is that insurance won’t cover any of it. 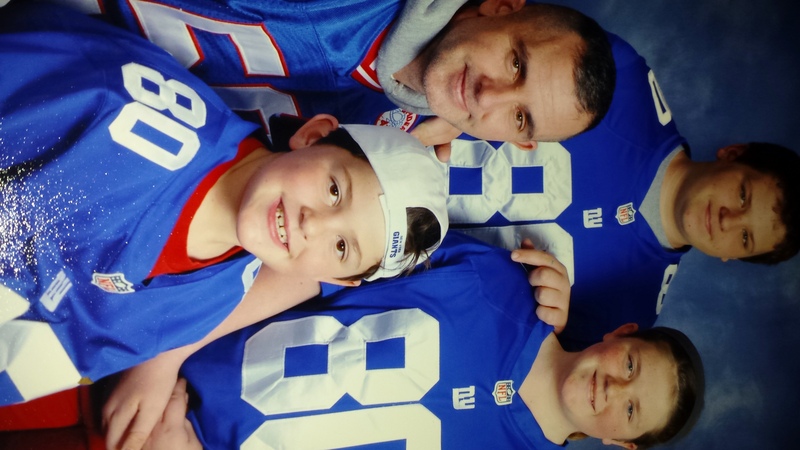 HSCT has been performed since the 1960″ S.
Mike is a single father of three young children (Mikey, 14; Reagan, 12; Ronan, 9). He joined the US Marines in 1989, serving in Operations Desert Shield and Desert Storm. After his time in the Marine Corps infantry he took time off to go to college and start his family. 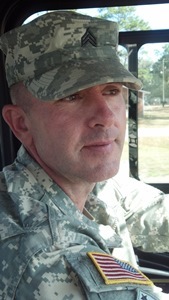 He then joined the Florida National Guard where he has trained many servicemen and women going overseas to Iraq and Afghanistan. He has coached youth football and both youth and high school lacrosse. Going overseas for the potentially life-saving HSCT procedure will be expensive. Not only is the procedure expensive but Mike and a caregiver will need travel and lodging covered too. We expect that we need to raise at least $60,000-70,000. Looks like it’ll have to be Mexico or Russia as Chicago in trying for FDA approval is not accepting me for the trial. One more shot as they will let me send in a PT video. 14 more days until Chicago!! So exciting. I’m praying and placing in Gods hands. 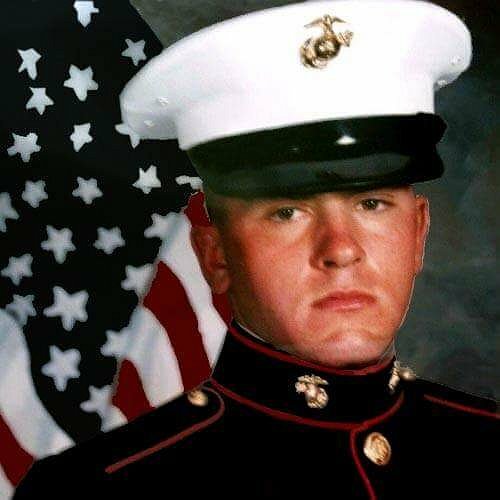 MIDDLEBURG – Mike Carns was an active duty Marine when he served in Operation Desert Storm and would have preferred to have remained on active duty, but he can’t even stay in the Florida National Guard because of multiple sclerosis. He was diagnosed two years ago and he has enough difficulty even walking. Carns is raising money to go to Mexico for a treatment not offered in the United States. With a Nov. 23 deadline fast approaching, Carns is asking for help garnering as much as $75,000 to travel to Mexico for treatment not offered in the U.S.
“I’m trying to go to Mexico for a procedure called an HSC – a Hematopoietic Stem Cell transplant. They go in and take your stem cells out of your body and cultivate them. While they’re cultivating them, they give you chemotherapy treatment to wipe out your immune system, he said. Earlier this year, Carns was raising funds to go to Israel for the procedure. It wasn’t available in Mexico at the time, so now that he doesn’t need to travel as far, he only needs about half of the $150,000 he was working toward earlier. Carns said his girlfriend will go along in order to care for him and that expense is not included in the amount he’s trying to raise. He said the procedure alone costs $50,000. Then, there is airfare, housing and six doses of chemotherapy here at home after he returns. These expenses have to be prepared for before he can be scheduled for the treatment in Mexico, which he said is booking patients through 2017. Carns said Mexico and Canada are the only nations in the Western hemisphere that offer the procedure and Mexico is the only one open to international patients. The HSC transplant is not a widespread treatment in the U.S. The Food and Drug Administration permits its use only for cer- tain life-threatening conditions and MS is not considered one of them. However, according to the National Center for Biotechnology Information website, U.S. government-funded national resource for molecular biology, clinical studies have shown the HSC transplant can completely halt disease activity in the majority of patients with aggressive relapsing and remitting MS. Research also indicates it leads to renewal of a healthy immune system. Carns said he has raised about $4,500, so he has a long way to go but refuses to retreat. The father of three said the effort is to spare nothing in fighting this medical battle. Carns said he has more energy in the morning but has to take a nap by the middle of the day to keep going a few more hours until evening. By that time, he’s fatigued just from average daily movements. “It’s like this – imagine you start your day with a bucket of water and everything you do is like a cup of water coming out. It isn’t going to last long,” he said, referring to how quickly MS saps his energy. Carns is being treated by the cancer center at the Veterans Administration hospital in Lake City, Fla. He doesn’t work and has no medical insurance. He is in a waiting period before he can begin receiving Social Security Disability Insurance. Multiple sclerosis turns the body’s immune system on itself and attacks the protective sheath encasing nerves, called myelin. The resulting damage disrupts signals from the brain from connecting with muscles and nerves, causing deterioration over time. For more information, visit gethsct.com and to donate, visit m.helphopelive.org/campaign/6491. Former U.S. Marine Michael Carns of Middleburg, shown here with his son, has turned to crowdfunding to help fund multiple sclerosis treatments in Mexico. Michael Carns pictured here with his girlfriend, Kelly Copeta. I will hopefully find a date next Friday for evaluation. Thank you everyone for your support and help. Thank you EVERYONE!! I appreciate it from the bottom of my heart. Thank you to everyone who has donated to this point, both here directly and also by coming to the fundraiser attended by so many this past spring. It is very touching. Battling FLARE ups and the VA with timely requests. Wearing me down and increasing disability. 1.5 months to go for fundraising for HSCT. I am going to go to Chicago to be evaluated. 3rd times the charm for application to the study in the U.S. Northwestern and Dr. Burt. This would keep me in country, but the price goes back up again. Hopefully getting the walkaide to help with walking until my procedure. 2 months to go. Need to get to $75,000 for my cure. The final push. Escaping the 100+ degree days in Florida. Patiently waiting for Nov. and my trip to Mexico I hope. Hiding in cooler NY for now. Thank you everyone who made May 9, 2015 a wonderful event. It was great seeing many old faces. I appreciate everyone coming out. God bless you all. Met my new neuro today. Started steroids for a week and something to see if it helps with fatigue. Was offered May 25, not sure I can get to the goal in time though. Changed to a new venue in our hemisphere. New date is Nov 23, 2015. Last person accepted for this year. Hopefully home in time for Christmas, but either way a great Christmas present. My life back. Looking forward to being able to walk again someday. Long road ahead but the tunnel has light. Easter was great. Spent time laughing with my kids. Today my daughter turns 12. Another happy day. Looking to do a second interview with fox/cbs and setting up an initial interview with ABC/NBC. All need to know this procedure has been around since 1968. Thank you all for your generosity and support. Next VA appointment is April 17. I am familiar with Northwestern. Unfortunately I do not qualify. 3/12 working on raising awareness as I see videos of people with the procedure I am holding out hope to walk again. Date from Israel is July5. New birthday and independence. Thank you everyone. It has been a great first few days. Hope lives. Did an interview with the print press (Clay Today) our local paper. I’m in contact with A lady in Israel right now getting the procedure from Oceanside, California. VA appt. Postponed by the VA til 3/18. 3/4/2015 VA appt. tomorrow with neuro. Day 1: starting funding. VA app set for Thur with neurologist. Mike, good luck and hope you reach that goal. HSCT is a game changer for sure. Hey there Mike.... We are praying for you and sharing your story. Here's to Mexico and hope for a cure! Hi Mike – I wish we could make it to Binghamton this weekend. Hang in there and keep fighting! Sending love from Texas. Hi Michael. Rhonda Wilkinson is my BFF and truly my God gven soulmate. I had the opportunity to travel to Chicago for her follow up appt for her transplant. I too have MS but am extremely fortunate that it is still in relapse/remit. I've had 7 spine surgeries and 16 other surgeries as I have a slew of other disabling health problems. I wish I could give more than 50 dollars but with me being on permanent social security disabilty, we rely solely on my husband's work as a District Manager/Sales Rep for a Gourmet Food Company. He is on 100 % commission. That said, I will continually donate to your stem cell transplant as our budget allows. I want to thank you, Mike, for your service to our country. I will begin spreading the word and asking friends and family to donate for your life saving cause. God Bless. Love ya babe!! You can do this!!! Thank you everyone. Very much appreciated.